In the winter months, providing shelter for feral (and house) cats is even more important than providing food (Calhoon and Haspel, 1989). Cold, wet weather can have adverse and potentially serious effects on cats. It is very important for cats to stay dry. If they become wet, they will need a shelter to dry off to prevent hypothermia or freezing. In most cases, however, feral cats are able to tolerate cold temperatures and make do just as any other wild animal. They search out warm dry shelter and find any and all nearby food sources. Feral cats will also huddle together in order to conserve heat. When several cats huddle together in a small shelter, their combined body heat easily raises the temperature inside the shelter. Providing shelter, along with feeding the cats, greatly reduces any winter hardships and helps to keep the cats healthy. Domestic cats on the other hand, probably suffer more from cold weather conditions than feral cats, because most don’t live strictly outdoors where they can develop a winter coat in the fall. Below are a few vital tips for caring for cats during the winter months. If your cat is allowed outdoors or you’re caring for a colony of ferals, make sure to provide your cat with an outdoor shelter. Some people believe that if a cat was raised outdoors she will form a resilience to the cold. This is not true; these cats can still freeze in the cold temperatures. For tips on how to build a shelter click here. Cats can seek shelter in the nooks and crannies of a car, especially in the cold winter months. Cats have been known to sleep on the tires, in the hood or in the engine itself. Knocking on the hood will scare the cat out of the car and prevent injury cat when you start the car. Feral cats require a boost in calories over the winter months, whereas, indoor cats who are allowed outdoors should not be overfed. Instead, these cats should be given more lean proteins to account for their increased activity in the cold. Also, if a cat is suffering from dry skin that’s flakey and itchy, you can add a small amount of olive oil to her food; don’t give her too much or it could upset her stomach. A cat’s water bowl will often freeze in the winter, so it is important to continually check it. 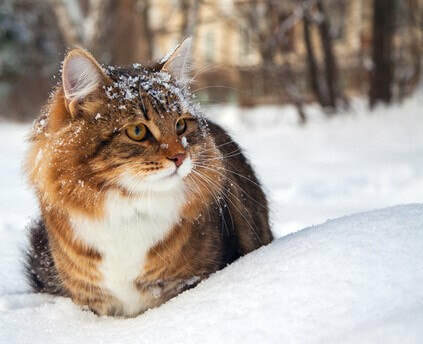 Eating snow is not enough to protect cats from dehydration and can lower the internal temperature of a cat’s body. A cat without a water bowl might drink from gutters and puddles, where they risk the chance of coming into contact with antifreeze, oil, and other harmful chemicals. You can use a thick, deep, plastic container to hold the water to slow down the freezing process. For porch cats, you can also use electric water bowls to prevent freezing. Antifreeze is highly toxic in cats. Be very careful when using it and clean up any spills or leaks immediately. Antifreeze is sweet tasting to animals so they may be attracted to it if it is not cleaned up. The change in temperature from the cold of the outdoors to the heat of a house can cause itchy skin in cats. Make sure to pat your cat dry to prevent this and pay close attention to their feet and toes. This will protect your cat’s paws from salt and chemicals that are often used on the ground during the winter. Cats are most susceptible to frostbite on their ears, nose, tail and toes because these areas do not have a lot of fur. Areas affected by frostbite will become pale or bluish white in color and will feel cooler than the rest of your cat. Take your cat to the vet for treatment and warm the skin with warm water on the way. Signs of hypothermia in cats are shivering, anxiety, crying and lethargy. Your cat’s body temperature and breathing rate can decline leading to a coma, therefore cat owners should take their cat to the vet immediately if they suspect their cat is suffering from hypothermia. Wrap your cat in blankets and use hot water bottles to keep them warm on the way to the vet. Predators such as hawks and eagles have less prey to hunt during the winter so cats are especially vulnerable to predation. Sleeping on the floor in the winter can be very cold. Provide your cat with a sleeping area with blankets, pillows or a pet bed that is elevated from the floor. Holiday plants such as holly and mistletoe are toxic to cats (and dogs). Plastic ones or other holiday plants should be used instead. Berman, N. (n.d.). “20 Essential Winter Safety Tips for Cats.” Retrieved from http://kittentoob.com/. Calhoon, Robert E., and Carol Haspel. “Urban Cat Populations Compared by Season, Subhabitat and Supplemental Feeding.” The Journal of Animal Ecology 58.1 (1989): 321. CrossRef. Web. 15 July 2014. “Cats in Winter.” (n.d.). Retrieved from http://www.cats.org.uk/oxford/feature-pages/cats-in-winter. Crosby, J.T. (October 3, 2017). “Holiday Plants That Are Poisonous to Pets.” Retrieved from https://www.thespruce.com/poisonous-holiday-plants-3385528. “Frostbite in Cats.” (n.d.). Retrieved from http://www.petmd.com/cat/emergency/common-emergencies/e_ct_frostbite?utm_source=bing&utm_medium=cpc&utm_campaign=PetMD_US_Search%3ENon-Brand_Emergencies-Cat&utm_term=frostbite%20in%20cats&utm_content=Frostbite%3EExact. Hall, C. (November 12, 2013). “Be Good to Cats: Knock on the Hood of Your Cat Before Driving.” Retrieved from http://www.catster.com/the-scoop/cat-health-safety-cold-weather-knock-on-car-hood. “Hypothermia in Cats.” (n.d.). Retrieved from http://www.petmd.com/cat/emergency/common-emergencies/e_ct_hypothermia. “How to Care for Outdoor Cats in Winter.” (n.d.). Retrieved from http://www.humanesociety.org/issues/feral_cats/tips/caring_feral_cats_winter.html.